We are just a few months from a general election in the UK now. The electorate often seems crudely split simply between those who want to spend other people’s money and those who have to earn it. Sometimes the split is about state control v individual freedom. We use the term left and right to easily encapsulate both, along with a large basket of associated baggage. As the split is reinforced, the middle ground is gradually eroded. That’s because as people take sides, and become increasingly separated from influence from the other side, they tend to migrate towards the centre ground of that camp. So their new perception of centre ground quickly becomes centre left or centre right. Exposure to regular demonisation of the opposing view forces people to distance themselves from it so that they don’t feel demonised themselves. But at the same time, if a person rarely sees opposing views, the extreme left and extreme right may not appear so extreme any more, so there is a gradual tendency towards them. The result is an increase of support at each extreme and an erosion of support in the centre. A bathtub voting distribution curve results. Some congregate near the extremes, others further away from the extremes, but still closer than they would have previously. Of course not everyone is affected equally, and many people will still sit in the overall political centre or wander, but it only needs some people to be somewhat affected in such a way for this to become a significant effect. I think we are already there. It is clear that this is not just a UK phenomenon. It extends throughout Europe, the USA, and Australia. It is a Western problem, not just a UK one. We have just seen an extreme left party take power in Greece but already the extreme right is also growing there. We see a similar pattern in other countries. In the UK, the extreme left Greens (and the SNP in Scotland) are taking votes from the Lib Dems and Labour. On the right, thankfully it is slightly different still. The far right BNP has been virtually eliminated, but there is still a rapid drift away from centre. UKIP is taking many voters away from the Conservatives too, though it so far it seems to occupy a political place similar to Thatcherite Conservatism. It is too early to tell whether the far right will regain support or whether UKIP will still provide sufficient attraction for those so inclined to prevent their going to the extremes. I think bathtub effects are a bad thing, and are caused mainly by this demonisation and nastiness that we have seen far too much of lately. If we don’t start learning to get along nicely and tolerate each other, the future looks increasingly dangerous. It’s amusing how words often mean the opposite of what they should intuitively mean. It started in trendy-speak when hot came to mean exactly the same as cool, when cool was still a word that was trendy. Wicked means good. Bad means good. Evil means good. Sick means good. Good no longer means good, but has been demoted and now means just about OK, but nothing special – that would be bad or wicked or sick. The trouble is that it isn’t just children making their own words to rebel against authority. Adults abuse language too, and in far less innocent ways. People’s minds are structured using words, and if you can bend the meaning of a word after those concepts have been assembled, all the concepts built using that word will change too. So, fair sounds a nice sort of word; we all want everything to be fair; so if you can gain control of its meaning and bend it towards your campaign goal, you gain the weight of its feel-good factor and its pleasant associations. Supporting that goal then makes you feel a better sort of person, because it is fair. Unfortunately, ‘fair’ has been perverted to mean resource distribution where your supporters take as big a slice of the pie as possible. Ditto equality. It sounds good, so if you can spin your presentation to make your campaign for superiority appear as if you want everyone to be equal, you can get an Orwellian, Animal Farmy sort of support for it, with your pressure group becoming more equal than others. But then ‘equality’ really means everyone except you being oppressed. As in Nineteen-eighty-four, Orwell’s Animal Farm was really observations on the politics of his day, and how language is so easily subverted for political advantage, but marketing and politics techniques have only refined since then. The desire to win power and to use words to do so hasn’t gone away. I think our world today is closer to Orwell’s 1984 than most people want to believe. Censorship is a primary tool of course. Preventing discussion in entire fields of science, culture and politics is an excellent way of stopping people thinking about them. Censorship as a device for oppression and control is as powerful as any propaganda. When censorship isn’t appropriate, the use of words that mean the opposite of what they describe is a good way to redecorate an image to make it more appealing and spin doctors are ubiquitous in politics. A ‘liberal’ sounds like someone who supports freedom, but is actually someone who wants more things to be controlled by the state, with more regulation, less freedom. A ‘democrat’ sounds like it should describe someone who wants everyone to have an equal say but is often someone who wants dictatorship by their supporters and oppression of others. ‘Racist’ used to mean someone who considers people of one skin colour to be superior to those of another, so became a word no reasonable person wants thrown at them, but because it was so powerful a weapon, it has been mutated endlessly until it has become synonymous with ‘nationalist’. It is most often cited now when skin colour is the same and only culture or religion or nationality or even accent is different. Such is the magnitude of the language distortion that in the UK’s recent immigration debates, Europhiles who want to protect immigration privileges for white Europeans over Indians or Chinese or Africans were calling those who want to remove those privileges racist. A Conservative minister used the farcical argument that trying to limit European immigration is racist even though they are the same colour because it would be racist if they were black. This language perversion makes it much harder to eliminate genuine skin colour racism, which is still a significant problem. Racism flourishes. The otherwise intensely politically correct BBC’s Dr Who frequently features the hero or his allies making deeply offensive racist-like remarks about other species with different shapes. People and organisations that are certain of their own holiness often are the most prejudiced, but their blinkers are so narrowly aimed they just cant see it. That blindness now pervades our society. It is tolerance and equality that are the biggest and most dangerous casualties of this word war. ‘Tolerant’ has evolved to mean extremely intolerant of anyone who doesn’t adopt the same political correctness and this new intolerance is growing quickly. If you or your friends get something, it is a right, and removing it is a tax, but if the other lot get it, it is a privilege that ‘fairness’ demands should be removed. People will happily accuse an entire group of people of being highly prejudiced, without realizing that such a statement is prejudiced itself. It is common to watch debates where contributors make the most offensive remarks about people who they see as beneath contempt because they hold some much lesser prejudice about some group they support. They just don’t see the same trait magnified in themselves. That they don’t see it indicates that they haven’t really thought about it and have just accepted a view from someone or somewhere else, which shows just how powerful changing the words is. It is only when thinking the meaning through that the obvious contradictions appear, but the emotional content and impact of the words is superficial and immediate. The new variety of militant atheists particularly have become very intolerant of religions because they say they are intolerant. They use the sanctimonious phrase ‘intolerant of intolerance’, but their intolerance is just as bad as that which they condemn. They condemn religious believers for hypocrisy too but are blind to their own which is just as bad. Their religious fervor for their political correctness religion is as distasteful as any medieval religious persecution or inquisition. They may not physically burn people at a stake, but activists do as much damage to a person and their career and destroy their lives as far as they can, whilst believing they are somehow occupying some moral high ground. Religion may be dying out, but the very same nasty behaviors live on, just with different foundations for exactly the same sanctimony. This new politically correct community are just as sure of their 21st century piety as any medieval priest was of theirs, just as quick to look down on all those not sharing the same self-built pedestal, just as quick to run their own inquisitions. PC activists demand tolerance and equality for their favored victim group and most reasonable people agree with tolerance and equality, but unlike most ordinary decent people, most activists don’t reciprocate it. Hypocrisy reigns, supported by an alarming apparent lack of self awareness. Surely reasonable people should accept others’ right to exist and accept that even if they might not agree with them they can agree to live peacefully alongside, to live and let live, like we used to until recently. Tolerance means putting up with people whose views you detest as well as those you love. Why have they forgotten that? Actually, they haven’t. Lack of self awareness isn’t the cause, not for activists. It isn’t the case that they’ve forgotten we need to get on, they just don’t want to any more. It is no longer a desire for peace and love and equality, but a desire for cultural supremacy and oppression of dissent. The clue comes as we see that the new vigorous pursuit of ‘equality’ is too often a thinly disguised clamor for privilege, positive discrimination, quotas, special treatment and eventual superiority. That isn’t new of itself – there have always been fights for privilege – but lately it is often accompanied by oppression and vilification of anyone not supporting that particular campaign for privilege. Trying to win the high ground is one thing, but trying to eliminate everyone else from the entire hill is new. It is no longer enough to get equality. All other viewpoints must be eliminated. It isn’t enough that I should win – you must also lose. That which started as a reasonable desire that all should be equal in all ways has somehow mutated into an ugly tribal conflict where every tribe wants exclusive power and extermination of any tribes that don’t support their dictatorship. This new intolerance is tribal conflict – less violent but every bit as nasty and aggressive, the sort that leads to violence if left unaddressed. It is war without the niceties of the Geneva convention. We see it manifesting itself in every dimension – political affiliation, age, gender, sexuality, race, culture, wealth, religion… It doesn’t use peaceful debate and open discussion and negotiation to get different groups living side by side on an equal basis. Instead, as I hinted in the first paragraph, seizing control over the meanings of words and distorting them is increasingly the weapon of choice to get a win instead of a draw. Mutual respect and the desire to live in peace, to live and let live, each to their own, has been usurped by assertion of superiority and demand for submission. It has to stop. We must live together in peace, whatever our differing beliefs and attitudes. The nastiness has to go. The assault on language has to stop. We need to communicate and to do so on a level playing field, without censorship and without the insults. We need to assert genuine equality and tolerance, not play games with words. That isn’t some rose-tinted fluffy bunny dream. It is a recognition that the alternative is eventual civil conflict, the Great Western War that I’ve written about before. That won’t be fun. The traditional political model is a line with the far left at one end and the far right at the other. Parties occupy a range and may share some policies with parties that are usually positioned elsewhere and individuals may also support a range of policies from across the spectrum. Nevertheless, the model works fairly well to describe general baskets of attitudes so is a useful tool to save time when discussing baskets of policies and attitudes. I am tempted to show another scale, with peace loving acceptance and tolerance towards the top and irate, intolerant, demonstrative attention seeking towards the bottom. Most of the chart as it is should be uncontroversial, showing a typical spread from old labour through to UKIP, though some may object to my filing the Lib Dems where I have. There has been migration and evolution of the parties certainly, but at least some of the old distinctions still generally apply. 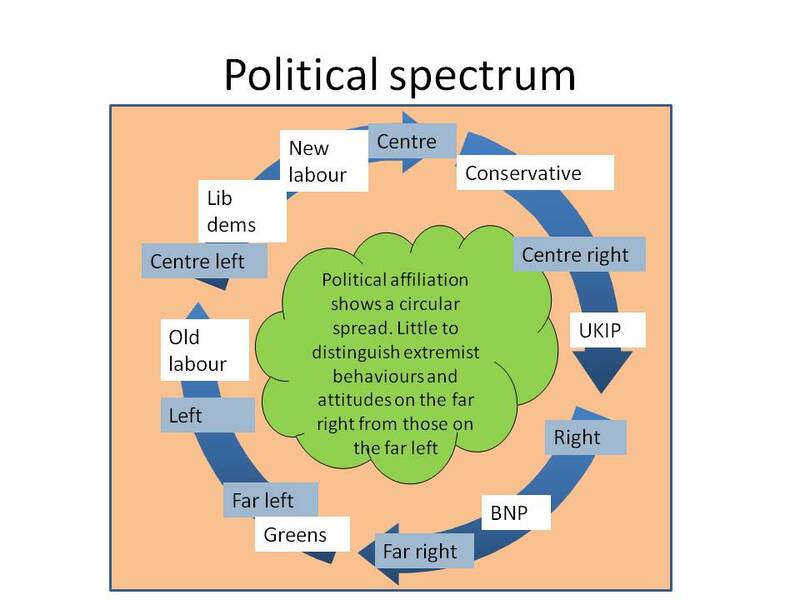 However, watching extremists from the hard left and right, it is often difficult to distinguish between them and that’s why I think it is appropriate to move to a circular model. Whereas the middle ground and both moderate wings share a reasonably sophisticated multidimensional view of the world and come to different conclusions mainly via application of different value sets, the extremes don’t conform to this. They extremes share a common overly simplistic and hardened attitude that often refuses engagement and discussion but loudly demands that everyone listens. A few cherry-picked facts is all they need to draw extreme conclusions. Differences in their reasoning are fairly minor compared to their overall behavioural type, so I draw them in close proximity. I am fully open to debate on the merits and drawbacks of this model. If it is rubbish, I will happily change it. But please don’t just say it is rubbish, please explain why, and offer an improvement.